John Merser (Brooklyn Mclinn) is a model son who enjoys a meager yet honest existence. He helps his father Abraham (Robbie Robinson) maintain the family towing business. Meanwhile, John’s younger brother Sean (Ary Katz) carries on in a slightly different family tradition. He participates in street boxing matches for money, against his family’s wishes. When Sean winds up owing a vigorous debt to Benjamin Poge (Darrin Dewitt Henson), John goes against his principles to reenter the world of street boxing himself. He seeks not fame or riches. He only wishes to wipe out his brothers debt. While R.L. Scott’s Touye Pwen is a gritty street drama akin to The Wire or The Sheild, Champion Road is in the same tradition as Ben Ramsey’s vibrant bare knuckle brawler Blood and Bone. Where Ramsey used the milieu of underground fighting to tell the tale of a post modern gun slinger, R.L. Scott resurrects a different western tradition: The retired gun who’s forced into donning his pistols one last time. In telling this tale, Scott employs a different aesthetic than Ramsey’s rather straight forward approach. The look of Champion Road is one of hazy pastels, almost like the blue tinge of chlorine treated pool water. This makes everything look as though the viewer is seeing it through the haze of early morning grogginess. It also serves as a clue that what the viewer is about to see has mythic quality to it. While Champion Road might be grounded in real world situations, it has an air of the fantastic about it. R.L. Scott offers a hero who is driven by family values and a sense of duty. That might seem quaint or even naïve by today’s standards, but I understand what Scott is going for here. The most interesting stories often involve an exceedingly honorable and/or humble man who must walk among nefarious types. 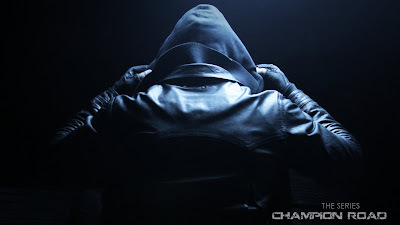 Champion Road also employs the strategy of allowing a seemingly mild mannered character to harbor a hidden talent, or be blessed with a super power. That is right out of the Marvel Comics playbook. Whereas Stan Lee’s creations come by there abilities as the result of a scientific accident, John developed his talents the old fashioned way. Further aiding the “make-believe” aesthetic are the fight scenes. R.L. Scott makes use of speed ramping and iconic mid-air poses. The fights are brief but memorable. The first one takes place in front of a wall covered in graffiti. The second, which features Chyna McCoy, gains a lot from his physical presence. McCoy has the chiseled physique of a comic book character, almost as if Jim Lee drew him. Both sequences have the effect of anime cut-scenes from a fighting game. They feel different from the dramatic moments, but not disjointed or out of place. The ending moment, where John fully accepts his destiny, is a time honored standard in many a genre. Superhero films and westerns both have similar moments where the protagonist suits up for war. Is it cliché? Of course it is, but R.L. Scott does it with style and conviction. The image of John pulling his hood over his head could just as well be the cover of a Champion Road comic book. I enjoyed this pilot episode of Champion Road for all the reasons that it is different from Touye Pwen. The latter puts the darker side of human nature on full display, while the former is about preserving ones integrity in such a world. Many B-Level martial arts pictures have used the milieu of underground fighting as an excuse for extreme bloodletting. R.L. Scott seems to be going after something with decidedly old fashioned sensibilities. Champion Road harkens back to a time when heroes spoke with their fists.